Of course, images like this – that use a cloud outline to indicate the Internet at large or a system that is too large or complex or irrelevant to diagram out itself – are what lead to the popularization of the word. The end user is not meant or expected to understand what happens after their data leaves their hands or how it got back out again (sometimes that is by design). It just disappears into the cloud and returns again upon request. Magic! Google Drive is a great example of cloud computing. Rather than saving a Word document to your local hard drive, you create and save documents to Google’s cloud. This means the document is retrievable from anywhere you have an Internet connection — your local computer, your smartphone, your work computer, etc. Some believe web applications like this will render operating systems increasingly irrelevant. 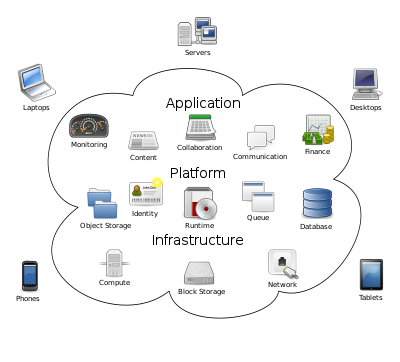 Cloud hosting is another application of cloud computing. Obviously, I’m sensitive about the use of the term, in large part because I think it leads to lazy language, inaccurate assumptions, and issues with data ownership. To be clear, there is nothing inherently wrong with a complex system; my problem is applying the word “cloud” to anything you don’t feel defining. Lately, though, end-users (aka, consumers) are becoming more aware of how their data is handled in the “cloud.” Where they store it, how they use it, who has access to it, whether or not it’s protected and secure, whether or not it’s actually private to them (surprise! ), and who actually owns it are no longer distant concerns for many Internet users — and that’s a good thing. Hi Kelly – thanks for talking about “the cloud” here on your blog. You’re right: most end-users don’t understand what it is. I certainly couldn’t sit down and field a Q&A about it. I think one of the biggest concerns (issues, fears, etc.) with cloud storage is what you wrapped-up with: privacy issues. Even if we didn’t need to worry about governments peeking in (ahem), there’s always the issue of hacking by those looking for opportunities to steal and profit. Or, just damage something for the sport of it. A local colleague of ours (The Technology Guy, Chris Roos) suggests Carbonite for backing up and cloud storage. Do you have and thoughts or opinions on their service? All good points! I don’t have any experience with using Carbonite myself, so I really couldn’t say one way or another. They certainly have the largest marketing budget of their field though, and I tend to approach those kinds of companies with caution (see: GoDaddy). Finding a reliable, long-term backup solution is one my very long list of long-term goals though, so once I get around to doing that, I very likely will post about the experience!